I've been really, really busy over the last few weeks dyeing yarn and fibre and photographing it, and now I am ready to announce to the world that my new venture is up and running. I've opened an Etsy shop so now you can buy yarn and fibre that I have hand-dyed. Please go take a look. I hope there will be something there that you like. It's not super-stocked with yarns yet, as I'm starting slowly and keeping it manageable. 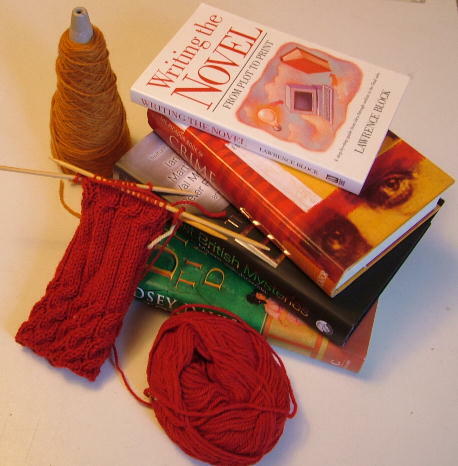 All the yarns and fibres are named after crime novels, so now you can knit your favourite book or your favourite author, or even just pick a colour you like and you might discover a book you'll love. "Field Grey" Elementary sock yarn, dyed so it graduates from pale grey through to charcoal along the whole length of the skein. I came back from Knit Nation at the weekend full of inspiration for new yarns, and I shall be going to Fibre East this weekend for more research (well, that's my excuse anyway). Say hello if you see me there and get a free MysteriousYarns keyring. I'll have my Ravelry badge on and I'd love to meet you all. To celebrate the new shop and because it's Fibre East this weekend I'm offering free UK shipping in the shop. Just use the code EAST1 at checkout and please tell all your knitting friends about the new shop. Hey Look - A Book Update!